I've been thinking a lot about my "motherly" and "wifely" duties lately - as the homemaker, chauffer (LOL if you only knew how much), maid, cook, homework police, cleaner, lover, etc. At times it feels overwhelming. 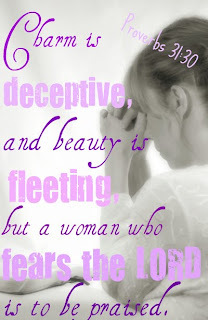 I REALLY want to be the Proverbs 31 woman. When I read through the passage, I get overwhelmed just about every time. I'm just SO thrilled it ends the way it does! Thanks for stopping by! be sure to stop by Lori's blog for more visual inspiration from scripture. I gotta say, the Proverbs 31 woman makes me feel extremely lacking, but it's certainly something to strive for. A god-fearing woman, oh yes!! what a powerful message! God bless you always. Love this scripture image. Truly was blessed by this today. We are sooo glad you are back! We've missed your wisdom! A great inspiration for the day...Happy WFW! Amen how to we need to be women who fear the Lord.. Inspiring post..
PS: urgent prayer request on arise 2 write. We shy away from that "God-fearing" part but that reverence that demands a response in holy living is critical for men and women alike. it's a nice verse! I hope all women applies it.